Generate flexible and colorful barcode, barcode generator software allow you to create barcode label, asset tag, sticker and ribbons of all keystrokes including alphabets in both upper case (A - Z) and lower case (a - z), numbers (0 – 9) and special keys (#, &, $ etc) in user defined style and format. Barcode generator utility facilitate to save produced barcode in picture file format (jpeg, jpg, bmp) at specified location and allow to print them on paper using normal printer. Barcode maker application provides options to change look and feel of created barcode image background color, caption color, caption font, style, alignment and barcode color etc as per user requirement. Barcode maker application uses all barcode standard font file like Code 39, Code 11, Code 93, Codabar, Interleaved 2of5, MSI Plessey, Code 128 (SET A, B, C), Postnet, Planet and many more. Software support all Microsoft windows operating system like 98, 2000, 2003 server, NT, ME, XP and Vista (all available edition). Barcode tracking software is useful in various organizations such as inventory, finance, telecom, shipping, retail stores etc. We suggest you to download free barcode maker trial edition to familiar with functionality, behavior and working of software and ensure that generated barcode is easily scanned by any barcode reader hardware device available in market. 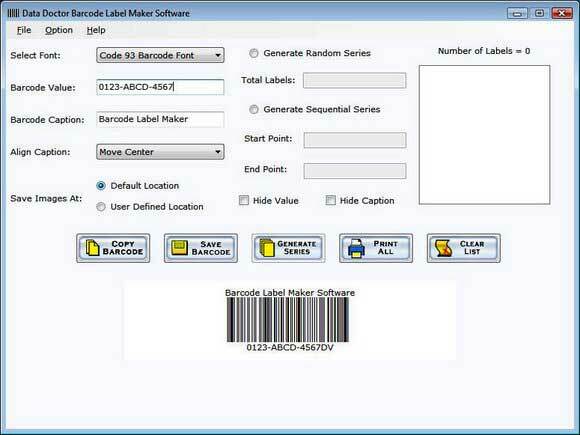 Barcode label creator software features: * Cost effective and GUI based barcode creator software. * Display instant barcode preview of given input string. * Enable user to print generated barcode using normal printer. * Create barcode in sequential or random format with user defined style. * Support various barcode font file including MSI Plessey and Planet. * Save generated barcode in picture file format. * Support all barcode reader hardware devices. * Work with all Microsoft windows operating system including Vista. * Provide complete install and uninstall support.